See Japan Probe for translation, and other election ads in Japan. A few months ago Professor Fravel of MIT published a rather thorough study examining how China (since 1949, PRC) has handled its border disputes, and also some insight into forecasting its future behavior in border disputes, in a view to also shedding light to how states handle border disputes in general. Foreign Affairs had a short book reviews in its April issue. The publisher (Princeton Univeristy Press) has provided the introductory section for a free preview. Prof Fravel has adopted a methodology which begins his analysis by defining the issues related to Taiwan and even HK/Macau as border disputes, which PRC has already put itself into a position that they are of a fundamentally different nature. Nevertheless, it appears Prof Fravel, beginning with a white sheet, has reached a conclusion which would be consistent with the alternative approach. Boston.com has an interview (see below) with the author (by Harvard Crimson/Boston Globe), providing some insights into the Taiwan issue (which I largely agree). In particular, Prof Fravel discussed his view on the likelihood of a war related to territory (Taiwan is perhaps the only likely source as we all know), and dispelled the myth that China may launch a "diversionary war" (and perhaps diversionary wars in general in the world!). Prof Fravel believes, to the contrary, China is likely to make concession when there is internal pressure! I have yet to acquire a copy of the book. But there are enough materials from PUP's introductory section which I hope to comment on in the next post. An MIT scholar asks: What would make China use its army? AS THE WORLD'S attention focuses on China's first-ever Olympics, the country is staging a glossy, upbeat show of hospitality. But behind that surface of prosperity and welcome, China's government remains a secretive regime immensely preoccupied with its own security. Leaders worry about the country's vast borders and restive minority populations, threatened by resistance from groups in the western province of Xinjiang, by calls for Tibetan autonomy, and the persistent diplomatic standoff with Taiwan. The instrument for enforcing all this is China's military, the largest in the world - 2.3 million people - and one of a handful with the capacity to launch nuclear weapons. How, and when, China uses its military power is a serious concern in Asia and beyond, and one that will endure long after the Olympic torch has exited Beijing. M. Taylor Fravel, a member of MIT's political science department and security studies program, has made a career of studying how, and when, China uses force. 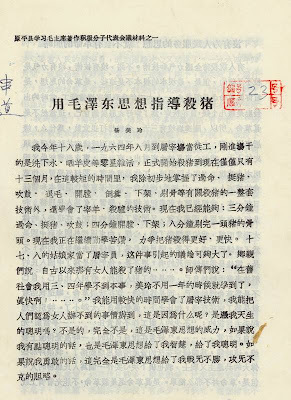 The 37-year-old professor, who spent two years of high school living in Taiwan, has combed through newly available documents from China's military academies and strategic thinkers. He has also examined nearly two dozen territorial disputes between China and its neighbors over the last six decades. In a book to be published next month by Princeton University Press, "Strong Borders, Secure Nation," Fravel explains how China uses its military to protect the security of the ruling party, preserve the country's territorial integrity, police a 14,000-mile border that touches 14 countries, and keep Taiwan in check. He also offers an intriguing argument about the relationship between instability within China and stability in the rest of the world. Ideas spoke with Fravel by phone and in his Cambridge office. IDEAS: The focus of your upcoming book and much of your scholarship on China is on territorial disputes. Why study them? FRAVEL: States have fought over territory more than any other issue. . . . The real question that is on many people's minds with respect to China is whether China will become a country that is highly likely to use force in resolving its international disputes. Territorial disputes provide one way to answer that question. IDEAS: So how likely is China to use force? FRAVEL: If you look at all of China's territorial disputes, you see that it's not especially prone to use force in these conflicts. One can tentatively infer from that that China is not necessarily highly prone to use force over other issues. IDEAS: What would provoke China? FRAVEL: The one specific issue - this is not terribly surprising at all - where China would use force under certain circumstances would be over Taiwan. IDEAS: What would a Chinese attack on Taiwan look like? FRAVEL: It depends on the political goal that China is trying to achieve. . . . The scenarios that are commonly discussed are a circle blockade of the island, which would be more of an effort to coerce Taiwan without engaging in direct armed combat. Another scenario is what is referred to as a decapitation strike, an effort to remove three-fourths of the leadership of Taiwan. A third scenario would be an amphibious assault on the island. However, many people view that as unlikely because amphibious assaults are hard to execute successfully. It would require probably more capability than China has. However force might be used across the Taiwan Strait, two points should be made. 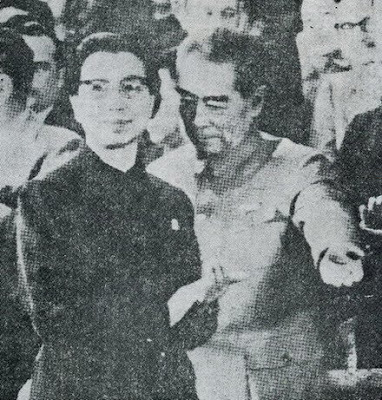 The first is that the use of force would be linked to some political goal, most likely preventing the island from completing what the mainland believes are important steps for the island to achieve political independence. . . . Second, if China were to use force across the Taiwan Strait, it would most likely try to limit conflict with United States. IDEAS: What would the American response be like? FRAVEL: If China used force across the Taiwan Strait? It would be a major crisis. . . . I don't think it would be a question of if the US would respond; the question would be how. IDEAS: You challenge the accepted theory that China might launch a war to divert the attention of its population. FRAVEL: The "diversionary war" argument posits that when leaders face threats to their political power at home, they are more likely to initiate or escalate a crisis abroad to divert attention of a dissatisfied public and rally society around the flag. What I found . . . is that when faced with ethnic unrest or legitimacy crises, the Chinese government has been more likely to cooperate in its territorial disputes in exchange for assistance in a domestic political problem that it faces. A recent example of this would be China's efforts to compromise with neighbors in Central Asia in the 1990s over a range of disputed territories at precisely the time when Xinjiang, the Chinese autonomous region adjacent to the Central Asian republics, was experiencing a high degree of ethnic unrest. . . . China, I argue, traded concessions in the territorial disputes for assistance in improving border security, cracking down on dissident groups that were operating in areas neighboring China. IDEAS: Are there examples of these "diversionary wars" from other countries? FRAVEL: The paradigmatic case that many scholars cite is Argentina's decision to invade the Falkland Islands in 1982. . . . According to one theory, Argentina invades the Falklands to distract its dissatisfied population from internal difficulties and unite the country around a nationalist goal of unifying the islands. IDEAS: What do your findings suggest for US policy toward China? FRAVEL: China is not as prone to what we might call muscle-flexing as the increasing prominence of nationalism and patriotism might suggest. IDEAS: What are some other American misperceptions about China? FRAVEL: The challenge of governing China from the leadership perspective should not be underestimated. You've got approximately one-fifth of the world's population in an area roughly the size of the United States with perhaps as much cultural diversity as Western and Eastern Europe combined. . . . Just keeping the state together, much less growing at a rapid clip, such that you don't have a major episode of civil unrest or ethnic unrest, is a daunting political and administrative undertaking. IDEAS: So the busier the Chinese are taking care of their affairs within the country, the less we have to worry about them? FRAVEL: I'm not sure I would quite say that. If the majority of American attention looks at China's potential in the world, I would say that the majority of the leadership's attention in China is focused internally. Samuel P. Jacobs is a senior at Harvard College and associate managing editor of The Harvard Crimson. Please see this for details. For the full story, see Hoiking blog, he said everything I wanted to say. I would add one more point. In this blog, I would not even delete comments that disagree with me, even if they are stupid or absurd. The only comments I would delete are spam (e.g. wow gold link spams). This chart is from an old post in Simonworld (where are you now Simon?). It does not need much explanation. 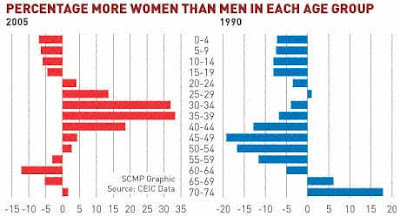 In 1990 There were more male than female across all age groups (till around 60 when men begin to die a lot faster). By 2005 (15 years later) the females outnumbered males VERY significantly. For more critical minds, one cannot help but ask the question, how could there be so large a change in such a short time span? We are talking about a change from -7% to +33% in the 35-39 age group! i.e. in 1990 there are 107 men for every 100 women, 15 years later, it is 67 vs 100. It must not be a result of "natural process". In fact, the female:male ratio at birth has been at a fairly stable 49:51 throughout the 1960s, and grew to 48:52 by 1980s and stabilized through this date (i suspect a small amount of selective abortion led to this rise), according to HK Government Census (you need to download excel format to see all the yearly data). Another evidence that this is a "non-natural" process is revealed by the 35-39 cohort data in 2005, who were 20-24 in 1990, for every 100 men there were 96 women in 1990 but 133 in 2005! Where did these 37 people come from? Well, it must be non-natural, which is immigration - emigration - death. Death rate is small for younger age (typically under 1% as we can safely assume). Since one does not need to give up the residency in Hong Kong, emigration has no impact on HK ID card holder (but I am not exactly sure about this, which depends on the definition of the census). The reason must be deal to NET immigration. How could this happen? Well, the most likely cause is, HK men married women from outside HK (mainly from mainland China). Therefore, if you read from news that it is a lot less likely for HK ladies to find a husband locally because of the gender imbalance, don't believe it. They are either confused or lying. The fact is: because HK men chose not to marry HK women (for various reasons), therefore there is a gender imbalance. The imbalance is not a cause to whatever phenomenon, it is merely a RESULT. Because of this choice by some men in HK, the gender ratio became imbalance. This is a significant difference. Kong girls cannot find a husband not because there are more Kong girls than Kong guys, but because Kong guys enlarged their target geographically while Kong girls did not (as much). 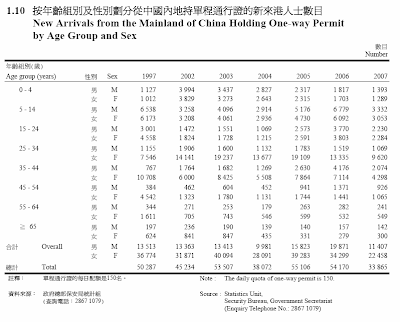 If one has the gender split of HK's immigration data, the myth of the gender imbalance would be easy to solve. Since I couldn't find such data, I had to do some calculation on my own. I took the population of each gender in an age group, e.g. 10-14, in 1991, "age them" by 5 year and compare with the age group 15-19 in 1996, and so on. The I calculated the % non-natural growth for each gender cohort for the years 1981-2006 (in 5 year increment). Finally I calculated the difference in these % non-natural growth. A high difference % means there is a significant difference in the non-natural growth (net immigration) between the two genders. From the table, it is easy to see that the non-natural growth of female over male is much higher in the 20-40 age group. In fact, between 1991 to 2006 non-natural growth of female is higher than that of male at from 10.4% to 17.6% in the 20-30 age group. p.s. (from commentator) please see pineapple farm's analysis 2 years ago (in chinese), I am basically repeating what he observed. pineapple farm also provided a link to the immigration statistics, which confirmed my hypothesis. You can see, for the 25-34 age group, women outnumbered men by around 10x, at 79499 vs 7940 from 2002 to 2006 (5 years net of 71559). From my calculation, non natural for the 5 year period is 61700 vs -3000, net=64700. The definition my be different as the age group shifts every single year plus there are immigration from other country and death/etc., so my estimate was pretty close. Tsugaru Strait: Japanese territorial claim is not always "greedy"
Anyway, I just noticed that Japan's ocean claim is very "restrained" over the strait passages, in particular the Tsugaru Strait (i.e. between Honshu and Hokkaido), and also Tsusima and others. 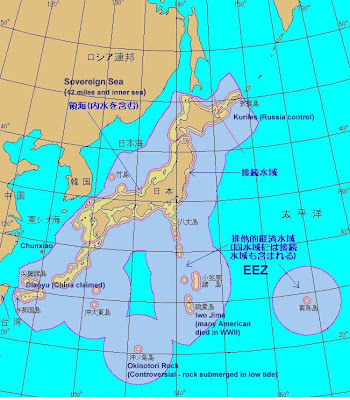 The reason, according to wiki, is quite simple, "Japan's territorial waters extend to three nautical miles (5.6 km) into the strait instead of the usual twelve, reportedly to allow nuclear-armed United States Navy warships and submarines to transit the strait without violating Japan's prohibition against nuclear weapons in its territory." 以下の図は、特定海域での領海の限界線を表示したものです（濃青色は内水を、青色は領海を 表しています)。For maps below, deep blue="internal water", blue=claimed sea border. I am not sure the technical difference between them though. This is, of course, a product of the cold war and of the post-WWII situation of Japan, as a conquered state. Given time, Japan would like to normalize it, to at least the "normal" twelve nautical miles (and it is fair for it to do so). The maps come from a post I found recently, commenting on a report that Chinese navy ships passing the Tsugaru strait late last year. Perhaps China wants US to respond to this, given the incidents of American spy planes and boats over the "international waters" just off Hainan on the edge of China's waters. America has been very silent on this event. Lucky whale, for escaping the fate of ending up on the sushi bar, or shall I say smart whale, for pretending to be a sub (pun)?